Afghanistan: Deja Vu All Over Again? 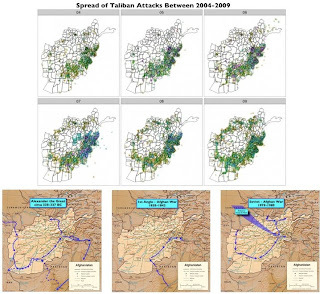 In one sense, Conway’s charts do not tell us anything new -- anyone who studies the reports about Afghanistan flooding the internet knows Taliban attacks have been increasing sharply. But in another sense, Conway has made a useful addition to our knowledge, because his graphical synthesis shows the breadth and scale of the increased intensity of combat. Bear in mind, however, the Wikileaks data base is not a scientific source of data; it is a compilation of reports of contemporaneous events, many made by young and low ranking observers. They can be thought of as impressionistic snapshots of a complex moving scene. No doubt, these reports also became more frequent and covered more territory as we increased the number of people writing these reports, as a consequence of our increasing forces deployed in Afghanistan over the years. No doubt, there are other biases in the database. On the other hand, this data base is the most comprehensive source of information publicly available and its shear volume gives it gravitas. Conway's charts also provide grist for other comparisons. 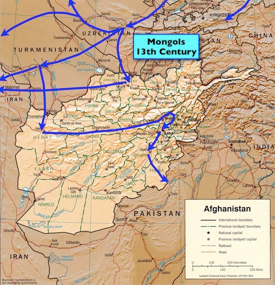 In Figure 1 below, for example, I have added three maps below Conway’s six charts to show the historic invasion routes of Afghanistan by Alexander the Great (330-327 BC, the British (1838-1842), and the Soviets (1979-1989 -- the shaded arrow sweeping through the middle is the airborn coup de main launched on Kabul on the first day of the campaign). I constructed these charts from multiple historical sources. Bear in mind, they show general lines of movements, not specific incidents like Conway's charts. Nevertheless, the historical comparisons make clear that the current war in Afghanistan will be one or lost on the same ground as the earlier conflicts -- namely, the rugged regions around what is now called the Ring Road, which encircles the even more rugged central mountains. With one exception (at least it the only one I know of), the conduct of war in Afghanistan has always resembled guerrilla war where the locals resist invaders and retain the initiative in hit and run attacks aimed at wearing down the invader by attacking the invader’s long vulnerable lines of communication in the "ring road" regions. That one exception, shown in Figure 2 below, is the Mongol invasion in the 13th century, which swept through the the central "impenetrable" mountains shown. What may also be unique about the Mongol invasion is that it may have had the most lasting impact on Afghanistan in an historical sense -- it's legacy was a changed the ethnic mix of the country. Today, Mongol influence can be seen clearly in physical features the Hazara people, who have a unique culture, and who occupy the forbidding center of Afghanistan. The priceless Budda monuments at Bamian destroyed by the Taliban in the 1990s were in Hazara territory. Bottom line legacies: Alexander left names of cities and a heroic legend, albeit he had to bribe hostile tribes to let him exit Afghanistan through the Khyber Pass. The British and Soviets left legends of humiliating defeats. And what of the Americans? Well, it is beginning to look like, As Yogi Berra would say, "deja vu all over again."